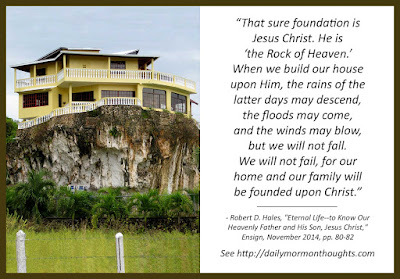 "The words of the prophet Helaman cry from the dust: 'Remember, remember that it is upon the rock of our Redeemer, who is Christ, the Son of God, that ye must build your foundation..., a foundation whereon if men build they cannot fall' (Helaman 5:12). Indeed, we will not fail. "I testify that such a home is 'a house of glory' (D&C 88:119; 109:8, 16). There we gather together to pray to our Heavenly Father in the name of Jesus Christ, His Beloved Son. There we glorify and give gratitude to Them. 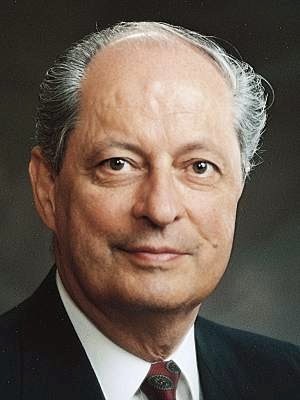 There we receive the Holy Ghost and 'the promise which [He gives] unto [us] of eternal life, even the glory of the celestial kingdom' (D&C 88:4)." The prophet Helaman delivered a stirring reminder to his sons that has become an important and frequently-quoted message to our day as well. He begins with "Remember, remember..."—a reinforced plea that they hold to this counsel. Helaman senses this is something we have a tendency to neglect, but that he knew was critically important to retain active in our thoughts. Failure in life follows from building on a foundation that is not solid; but it also comes when we forget the counsel to base our life and decisions on the rock of the Redeemer. What does it mean to build upon the foundation of the Rock of Heaven, the Redeemer of man? It means that everything we do is based on His role and influence. It means that our decisions are made in the light of of His teachings and commandments. It means that our actions strive to follow His example. It means that every word and deed is motivated by recognition of, and gratitude for, His love and atoning gift to us. And a home and family built upon this Rock truly becomes a divine institution, a foretaste of heavenly potential, a "house of glory." What a marvelous ideal to strive for!